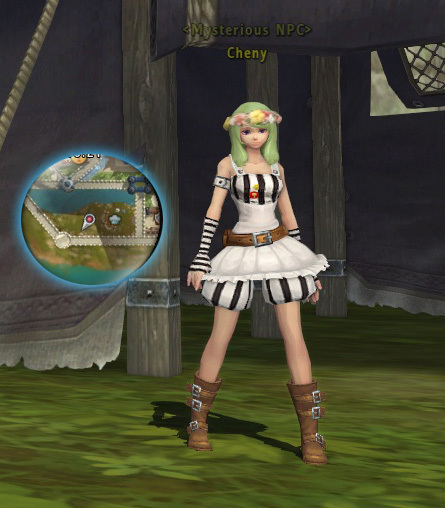 Cheny has been travelling the world collecting mysterious new items to stock in her new Secret Shop. This guide will help demystify Cheny's Secret Shop and introduce you to the new features included in the Winter 2015 Update. If it’s secret, how will I find it? Well, you’re in luck! Cheny has decided to share the location of her Secret Shop. The shop can be found in SW Prontera. Under the Zeny display on your UI there is a spot for a new type of currency. This currency is Diamonds, and they’re Cheny’s best friend! Diamonds are used to purchase items from Cheny’s Secret Shop as well as to Transmogrify items through Leprechaun. Daily Attendance: Diamonds are offered as an attendance reward on Day 7 (135 Diamonds), Day 14 (270 Diamonds), and Day 21 (540 Diamonds). If you log in without missing any days, you'll receive the diamonds on the golden marked days! Solo Dungeons: Maden in East Mt. Mjolnir's Bouquet Town has new quests for solo dungeons that give Diamonds as rewards. Please see the Solo Dungeon Guide for more information. Kafra Shop: Diamonds can be purchased from the Kafra Shop. Additional ways of obtaining Diamonds will be added in future updates. Items from Cheny's Snowflake Box are bound, and may be gender-specific. This box will yield one designated dye from a range of popular colors, including Brown, Blue, Orange, Purple, Mint, Yellow, Pink, Black, and White. 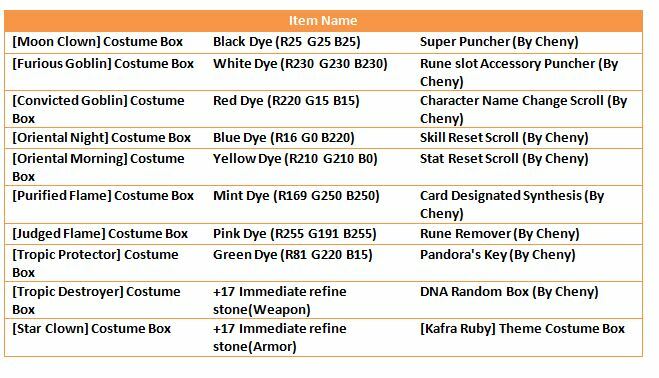 This box contains more colors of dye than Cheny’s Dye Random Box. The Secret Shop is offering seals of Vulcan, Veriel, Hoenheim, Demeter, and Guardian. The Cheny version of the seals have positive values only and have different stat rates than regular seals. These Seedrunes can be purchased from Cheny using Burnt Seedrunes and a small amount of Diamonds. Defective Seedrunes yield a variety of seeds, including green and red types, and Burnt Seedrunes by chance. 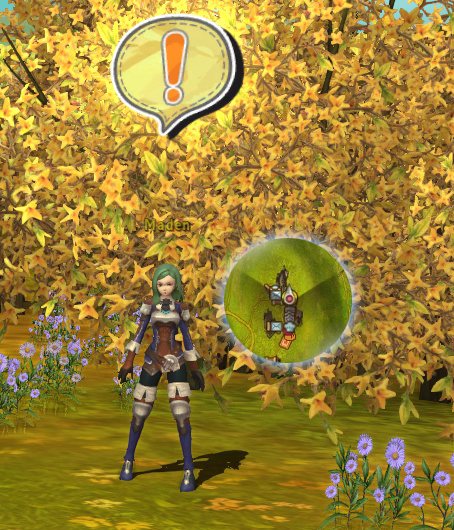 Defective Seedrunes can also be obtained through the solo dungeons as random monster drops and rewards. Please see the Solo Dungeon Guide for more information. Cheny’s Snowflake, Cheny’s Snowflake Box, Cheny’s Lucky Dye Box and the Seals of Vulcan, Veriel, Hoenheim, Demeter, and Guardian (By Cheny) are limited offerings. These items will be replaced in future patches.